Do you backup your website(s)? Ever? I know I didn’t which is the main reason I developed this software. You see I have a lot of websites and look after even more for other people. Backing up your websites has always had 2 draw backs. 1) You have to remember to do it. 2) You have to have a lot of time to do it since it’s a very manual process. My new software solves both of those draw backs for those of you lucky enough to have your web hosting on a cPanel web server. Let me first tell you how to backup your website using cPanel. a) Go to your http://website.com:2082 and enter in your credentials. Now you can do all that or you can set it up in Backup Smart and it will do it all for you on a schedule that you set. Couldn’t be simpler. Have a look at this promo video I made for the software. If you think it’s something that you could use, I have a 7 day free trial for it, and if you read this post prior to 02Feb09 then you can get an early bird special offer of just $7 which is a saving of $30 off the $37 price tag that I’ll be selling this for. 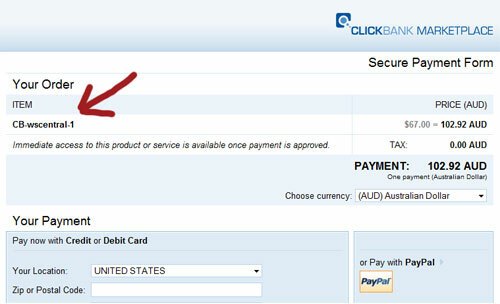 Clickbank Order Page Images – Are You Using Them? Did you know that Clickbank now offer you the ability to put a product image and a title into your products sales order or checkout page? This came about in April 2008. (Clickbank didn’t find it worthy of letting anyone know, well I didn’t get an email about it and I’m on their list). Clickbank had a big year in 2008 – starting a blog, taking Paypal payments, offering to pay their users via direct debit instead of cheques and many other improvements. But since I’ve only just realised this great feature about product images was sitting under my nose all this time, I thought I’d share this with you in case you also didn’t know. What’s the big deal you ask? Well it’s all about presenting yourself in the best possible light to your customers. Clickbank have certainly cleaned up their order page they present on your behalf, but it’s still not your order page so to speak. You need to get as much of your info on that 3rd party order page to make it look less foreign to your buyers. (Same goes for Paypal if you use that). If you don’t have an image for your product then I urge you to get one made at rentacoder.com or elance.com for around $20-40USD. The credibility it builds for you and ability for affiliates to use your product image in their promotions is worth it alone. Here is a very interesting statistic and a potential source of income for a freelance graphic person – “Amazingly 27 percent of ClickBank sales pages have NO usable image whatsoever” (source). 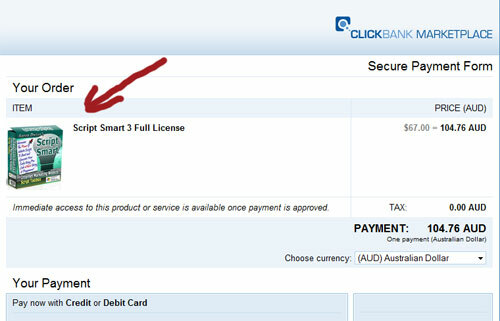 Here’s a screenshot of Script Smart’s Clickbank order form before… You can see that I didn’t have a title of the product and it was just the default text. Not very professional at all. Had to wait 1 day for it to approved, then associated it with the product. Now here’s my order form with the image in place. Looks so much more professional and I’m happy again. 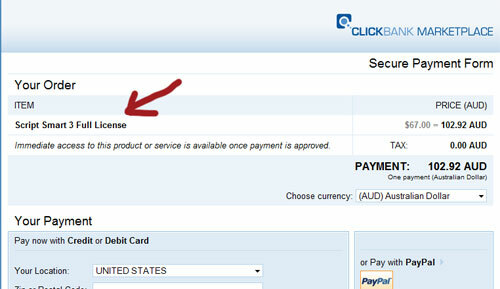 Make sure you are making good use of this excellent feature of Clickbank. Leave me a comment below as to your thoughts on this. Do you even use a product image to help promote your product.? I believe it’s mandatory for all products digital and physical. This is mostly a bug fix, but there is a major difference under the hood with this version. 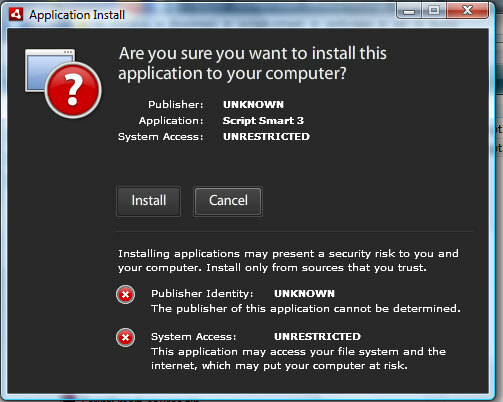 Adobe AIR uses a security feature to make sure that you are installing the software that you think you are and not software that’s been compromised by another party. So in order to get this added security software developers need to digitally sign their software to build trust and confidence with their end users. From a professional business point of view, that just plain screamed I’m a cheap and dodgey developer. So since Script Smart 3 now uses Adobe AIR, digitally code signing an application is easy. Not cheap, but easy. I am producing all my software in future in Adobe AIR (so far 3 products) and as such decided getting a secure digital identity for my parent company Web Smart Central as a very solid investment. What does all this mean for you the end user. To new users it’s just normal business, to existing users, well that’s where it get’s tricky. 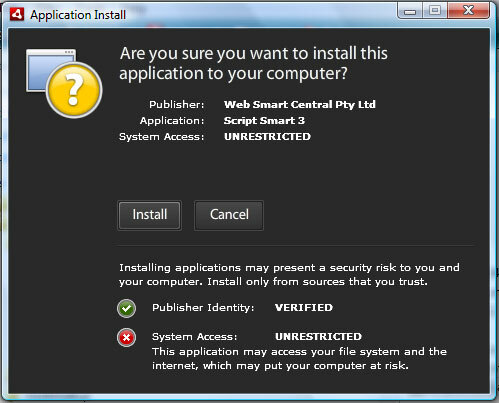 The new application that is signed as coming from Web Smart Central is treated a new software install from the licensing database perspective and as such Script Smart will ask you to enter your email address that you signed up with. I’ve tried to avoid this, but alas the licensing database is now in such a mess that most of the existing users will need their serial numbers reset before they will be allowed to use Script Smart after updating. There’s no point in putting this off, since future updates (which are coming soon) will trigger this anyway. Step 3. Enter your email address that you signed up with and you should be right to go. NOTE: Do not try to run Script Smart first and let it do the upgrade, this will lock you out and you’ll need to contact me to get your serial number fixed. I whole heartedly appologise for this, but I have to make the software better for you in the future and this needs to be done. If you get locked out of Script Smart during this process, please submit a support ticket, or email me and I’ll promptly fix your serial number. Are you trying to get FAQ-Tastic v1.07 to work on WordPress 2.7, what a drama.! Step 2. Download my FAQ-Tastic v1.07 WordPress 2.7 Patch file. Step 3. Upload all the original FAQ-Tastic Lite files to your WordPress plugins directory. Step 4. Before you activate the FAQ-Tastic plugin, make sure to upload all the patch files straight into the the faq-tastic plugin sub directory overwriting the original files that you just uploaded. Step 5. Go to your Plugins area in the admin of WordPress and you should see a plugin with v1.07 Patched for WP2.7 that you can activate. Thanks go to Copernicus who explained the problem. I just implemented it and thought I’d share. Enjoy. Drop me a comment if you found it helpful. Finally I have restructured my websites relating to internet marketing and have decided to reuse one of my old domains websmartcentral.com as the central hub in my wheel of websites. I used to use that domain for my Australian Web Hosting company, but switched over to netrospect.com.au in late 2007. My Business Web Hosting company is growing every year, and is as close to an offline business as I’d ever like to own and operate. It’s specifically for local Australian businesses only. Content that previously was posted to my personal website aarondwyer.com about internet marketing will now be posted here. I have some big plans for this website, which include talking about internet marketing tools (not just the ones that I create), general internet marketing information from the trenches, and both audio and video interviews. I’ll also be adding resources that I use for my internet marketing to the resources section of this website.